The entire manufacturing process, from start to packaged chips ready for shipment, takes six to eight weeks and is performed in highly specialized facilities referred to as foundries or fabs. 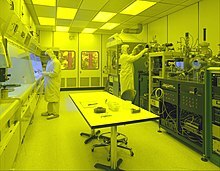 In more advanced semiconductor devices, such as modern 14/ 10/ 7 nm nodes, fabrication can take up to 15 weeks (about 4 months) with 11–13 weeks (3 to 4 months) being the industry average. Production in advanced fabrication facilities is completely automated, and carried out in a hermetically sealed, nitrogen environment to improve yield (number of working microchips vs the number of microchips made in a wafer) with FOUPs and automated material handling systems taking care of the transport of wafers from machine to machine. A typical wafer is made out of extremely pure silicon that is grown into mono-crystalline cylindrical ingots ( boules) up to 300 mm (slightly less than 12 inches) in diameter using the Czochralski process. These ingots are then sliced into wafers about 0.75 mm thick and polished to obtain a very regular and flat surface. Modification of electrical properties has historically entailed doping transistor sources and drains (originally by diffusion furnaces and later by ion implantation). These doping processes are followed by furnace annealing or, in advanced devices, by rapid thermal annealing (RTA); annealing serves to activate the implanted dopants. Modification of electrical properties now also extends to the reduction of a material's dielectric constant in low-k insulators via exposure to ultraviolet light in UV processing (UVP). Modification is frequently achieved by oxidation, which can be carried out to create semiconductor-insulator junctions, such as in the local oxidation of silicon ( LOCOS) to fabricate metal oxide field effect transistors. More recently, as the number of interconnect levels for logic has substantially increased due to the large number of transistors that are now interconnected in a modern microprocessor, the timing delay in the wiring has become so significant as to prompt a change in wiring material (from aluminum to copper interconnect layer) and a change in dielectric material (from silicon dioxides to newer low-K insulators). This performance enhancement also comes at a reduced cost via damascene processing, which eliminates processing steps. As the number of interconnect levels increases, planarization of the previous layers is required to ensure a flat surface prior to subsequent lithography. Without it, the levels would become increasingly crooked, extending outside the depth of focus of available lithography, and thus interfering with the ability to pattern. CMP ( chemical-mechanical planarization) is the primary processing method to achieve such planarization, although dry etch back is still sometimes employed when the number of interconnect levels is no more than three. Chips are often designed with "testability features" such as scan chains or a " built-in self-test" to speed testing, and reduce testing costs. In certain designs that use specialized analog fab processes, wafers are also laser-trimmed during the testing, in order to achieve tightly-distributed resistance values as specified by the design. Once tested, a wafer is typically reduced in thickness in a process also known as "backlap" , "backfinish" or "wafer thinning"  before the wafer is scored and then broken into individual dice, a process known as wafer dicing. Only the good, unmarked chips are packaged. Plastic or ceramic packaging involves mounting the die, connecting the die pads to the pins on the package, and sealing the die. Tiny wires are used to connect the pads to the pins. In the old days[ when? ], wires were attached by hand, but now specialized machines perform the task. Traditionally, these wires have been composed of gold, leading to a lead frame (pronounced "leed frame") of solder-plated copper; lead is poisonous, so lead-free "lead frames" are now mandated by RoHS. ^ a b Neurotechnology Group, Berlin Institute of Technology, IEEE Xplore Digital Library. “ Regression Methods for Virtual Metrology of Layer Thickness in Chemical Vapor Deposition.” January 17, 2014. Retrieved November 9, 2015. ^ CNET. “ Why tech pollution's going global.” April 25, 2002. Retrieved November 9, 2015.